Challenge 2015: Travel around Europe for 5 weeks with only a carry-on bag. Result: Success and no looking back. Now with 6 months of travelling on the cards, the recipe is the same. When we go on an adventure, our number one priority is to remain light and portable. Always on the go, there is nothing worse than being weighed down by a large bag of possessions you don't need. When packing for anything you must first ask yourself, is this item really necessary? As someone who loves clothes, I am always endeavouring to find that right balance. Once you do get it right, you will never look back. Pack light and be ready to breeze through customs, avoid the stress of luggage carousels or having to pay extra to check in your bag. Your possessions will always be with you so you can simply throw them on your back and be the first ones through customs. You will be truly grateful when you are running through an airport trying to make your tight connection or when you can avoid the queues by taking the stairs instead. A constant frequenter of airports, I've realised the importance of having my arms free. Free to flip through maps, buy tickets at the station, find the right currency and all without worrying where I have left my suitcase. Our wanderings take us places where the terrain can be tricky so a backpack solves all of our problems. I've seen people take 23kg bags for a 3 day weekender. Standing next to me with my 5kg backpack it seems like overkill. Do you really want to lug that around with you? I get it you "had to check in your toiletries anyway"... "couldn't find your smaller bag".. "may as well fill up the extra space". And thats the simple answer isn't it? It seems that we all have a need to fill empty spaces with things. The larger the house we have the more possessions we fill it up with. Solve this by finding a carry-on bag that is right for you. Make sure to check the comfort, the size and the weight. While I love my Herschel back pack I can admit that its lack of chest or waist straps means that I feel the weight a bit more. Dan now swears by his custom-made 30 litre BO Gear spare camel backpack. Made locally in Brisbane, he was able to modify it specifically to his needs and the clam shell design makes for easy packing. Not only are they super cute but small toiletries mean that you never have to check in your bag again. It really is amazing how long you can make a 80g dry shampoo last. Do not fear women, if you run out you can always buy more or simply go au naturale. If you can't find what you are looking for in miniature, simply load up on travel containers at your local pharmacy and transfer your favourite products into them. My bag is packed full of essentials by Sukin and Moo Goo. The natural and vegan friendly ingredients are good food for your skin and hair. Trilogy's natural perfume oil rolls on fresh, fits snugly into my bag and comes without nasty chemicals. Choose eco-friendly bamboo toothbrushes to have less impact on the environment. Dan has simplified his toiletries with the use of Dr Bronners all in one soaps. A little goes a long way. I'm the first to admit that getting your clothes in and out of your backpack without making a mess is a skill. Keep organised by using packing cubes. Not only does this help to categorise your belongings and keep them neat but fitting them into your bag becomes a game of Tretris. Kathmandu and Eagle Creek stock a range of sizes at a good price. I am the first to admit that technology is a huge part of our lives. Dan allocates 50% of his weight allocation to his "tech centre". It is so important that you are always mindful of the size and weight as everything soon adds up. Choose a compact camera like the Sony RX100 which is not only light weight but still takes amazing photographs and videos. Choose an iPad Mini and an 11 inch Macbook Air over their much larger counterparts. Trade in your stack of books with a portable e-reader like my Kobo. I swear by it as I can connect to wifi wherever I am and purchase another good read when I have run out. While beanbag neck pillows are the go-tos on planes, be clever and use an inflatable pillow. I even take my Sea to Summit head pillow with me to the beach. Travel Towels are also a life saver. We use the Discovery Trekking towels as they take up no room, dry quickly and don't have that yucky micro fibre feel. Most airlines allow you to take a handbag or laptop bag with you on the plane in addition to your carryon. What I have discovered is that these items are never subjected to the scales. 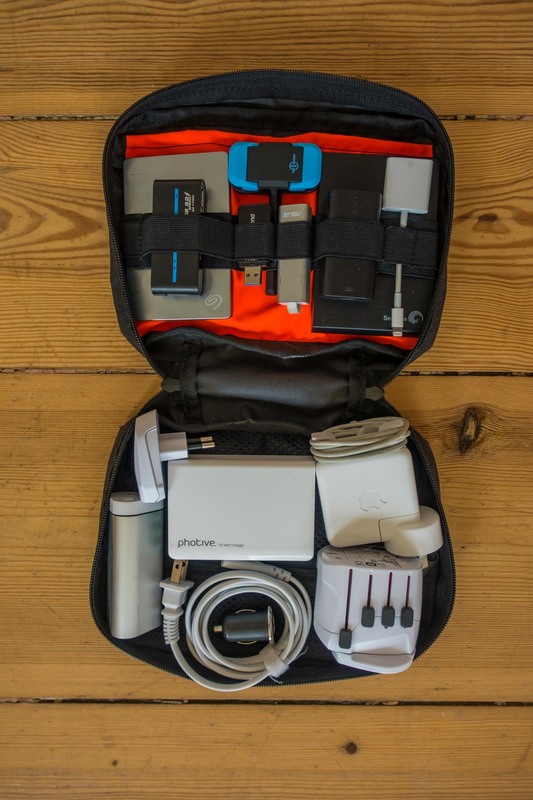 Pack these full of your technology and deceivingly heavy items. Take care in selecting a hand bag that has multiple compartments and secure zips or fasteners so you can keep your gear safe from pickpockets. When Dan was called out for having his bag a kilo overweight, he simply took out two of his jackets and put them on. Problem solved. Instead of trying to squish your woollen jumper or boots into your pack, wear them while you fly. Not only does that leave more room in your bag but you won't shiver through your flight either. In the end it all comes down to how ruthless you can be. Only pack the essentials. Do you really need 6 bikinis? No, but make the use of interchangeable or reversible prints instead. You are never going to get it right off the bat. I learn from every trip. It can definitely be a help to pack with an equally ruthless partner who will hold you accountable to your decisions. Over to you! How do you pack light?